Martina Gates got her first camera at age 6, and fell in love with horses soon after. The Icelandic horse is one of her favorite subjects to photograph. (See her work featured in the September 2016 issue of Horse Illustrated.) 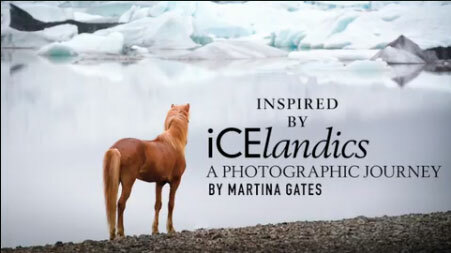 We talked to Martina to find out more about her photography and her special connection to the Icelandic horse. When did you first become involved with horses? I grew up in the city of Hamburg. Riding stables were on the outskirts and nobody in my family was into horses. My parents divorced when I was 8 and my father had bi-weekly visitation with us. He began looking into activities for us kids and stumbled upon a riding stable in biking distance from his house. It was a wonderful old barn with a great old-fashioned riding instructor. I immediately fell in love with the horses. I spent countless hours there and learned to ride well. As children we had barn chores including cleaning tack. The more we cleaned the more we earned a free riding lesson here and there. Riding lessons included dressage, vaulting, and jumping. On weekends we could earn a spot on the drill team. We had fancy jackets and rode to music. It was the best time of my childhood. I never owned my own horse until later in life but horses stayed with me all through the years. How long have you been photographing horses? Photography has been a big part of my life. First in front of the camera for 20 years [as a model] and then behind. It would have been a natural progression to photograph horses but it was not until 2007 when I received a wonderful gift from my daughter to go photograph Mustangs in the wild. It was a profound experience. Watching the interactions within the herd dynamic in a natural setting was breathtaking. I decided right then that this was what I wanted to do for the rest of my life. I graduated from Parson’s School of Design with a degree in graphic design. I studied printmaking while I was there and loved the various printing methods. Copper photogravure and silkscreening are two of my favorite and I am always experimenting. What do you think is unique about the way you see and photograph horses? I am drawn to horses in natural environments. Unbridled and free. Every time I pick up my camera to photograph the horses I let myself be surprised. The horse cannot be staged; it has to be organic. There are times I will see a landscape and envision the horses there. I have often brought horses to those settings and let them be. Sometimes nothing happens; sometimes energy just explodes. I wait for moments, compositions, and a connection. The eyes of a horse say so much as well as body language. I love the connection between the natural setting and the horse. It could just be the movement of the wind in the hair or a shadow cast. I rarely photograph a horse with any tack, something human just overpowers the nature of the horse and it loses the feel for me. How did you first discover the Icelandic horse? In the early 90’s we decided to finally get a horse. In my mind I wanted a smaller horse that was hardy and easy to keep. Horse Illustrated had just come out with an issue about the Icelandic horse titled “Horses of the Gods”. An Icelandic horse was on the cover and we bought the issue immediately. It was a multi spread article with lots of great photos. The article was well written and after reading it we were so excited to meet this incredible horse. We contacted one of the breeders in our area listed in the classifieds section and made an appointment to meet the Icelandic horse. It was an instant connection. The horses had an incredible temperament, the gaits were amazing and the horse was pure fun. There was no turning back. Now, all these years later it is a real honor to have my Icelandic horse pictures in Horse Illustrated. It is like coming full circle. What is it that you find most special about Icelandic horses? We now own over 10 Icelandic horses. They are addictive and all have such different personalities. The Icelandic horse is a very special breed. It is, I believe, the only horse breed that is bred for carrying power as well as pushing power. Apart from the basic three gaits, walk, trot, and canter, Icelandic horses have the pace gene which makes them gaited. Some are 4-gaited with tölt, a four-beat lateral gait that is easy to sit and can vary in speeds from slow to very fast. Others are 5-gaited with tölt and pace, a high speed, two beat, lateral gait that is used in a sprint and is used for racing purposes in Iceland. Icelandic horses average 13-15 hands and come in nearly all colors except Appaloosa. Their spirit and willingness compare them to riding a sports car. Apart from their wonderful characters and temperament, the Icelandic horse brings together people. I have made more great friends through the Icelandic horse than anything else in my life. We ride together, travel, and meet throughout the year. We are all connected to Iceland through our horses and its rich history. All Icelandic horses trace back to Iceland where they grow up in herd environments on large acreage learning to be surefooted and respectful. There is little contact with the youngsters until they are brought in for training in their 4th winter. No horses have been imported into Iceland for over 1,000 years and those that leave may never return. It is a very pure breed with natural gaits and no enemies. What’s it like to be with these horses in Iceland, in their native environment? Iceland is a perfect environment for horses. The grass is very rich and nutritious and the land on which they grow up is vast. Weather can be harsh with high winds and moisture but the temperatures don’t vary greatly from summer to winter like they do here in North America. One can see horses just about anywhere in Iceland and there are many horse farms. In the summertime some farmers let their horses live in the mountains to get strong. In the early fall riders then ride up and round them up again. There are riding trails along most of the roads and it is not uncommon to see a group of riders along the road. In the summertime it is custom to take the horses on trek through the Icelandic landscape. Experiencing the horses in this magical landscape is beyond words. Their easy gaits and surefootedness propel you over territory that would be difficult for us to walk on. The treks often go through rivers, over mountains and along the beaches. It is breathtaking and something that can only be done in Iceland. They take all their horses with them, riding from place to place over the course of 5-10 days. A group of riders will be in the front leading the way and setting the pace, then you can see free running horses of up to 100 following along, no halters, no lead lines – just free. At the end another group of riders makes sure to keep the horses moving and gathers up stragglers. At rest stops the horses are herded into makeshift enclosures and the riders have a snack before saddling up the next horse. 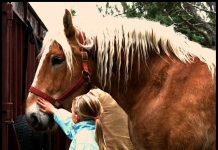 It is a special trip that every horse rider should experience. Great information on these Icelandic ponies/horses. I lied the video and the music that went with it.